UH 1 Tony Armas Jr. UH 230 Ken Griffey Jr.
2007 Topps Updates & Highlights Baseball was intended to close out the 2007 baseball season, offering flagship cards of rookies and players who switched teams over the course of the year. The set provides that, as well as a squirrel and an intentional error straight out of the 1989 Baseball Card Handbook. Cards in the 330-card base set come with a UH prefix. Cards use the same black-bordered design used in 2007 Topps Baseball. 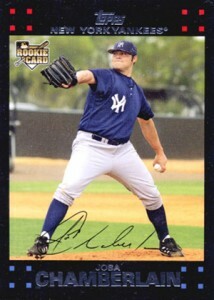 Rookies in 2007 Topps Updates & Highlights Baseball include Tim Lincecum, Justin Upton and Joba Chamberlain. Chamberlain has a reverse negative short print variation as well that is extremely rare. Jacoby Ellsbury, who was not on the original checklist, is a short print variation for card 100. Abraham Nunez is the more common version. A third short print is not numbered as a part of base set but has the same basic design. The Poley Walnuts card, depicting a squirrel who scurried around Yankee Stadium, got a lot of attention when the set first came out. With the attention came high prices. They have softened somewhat, but the squirrel cards still command a premium. Base set parallels mirror those found in the flagship set: Red Back, 1st Edition, Gold (#/2007), Copper (#/56), Printing Plates and Platinum. Hobby boxes comes with a Chrome Refractor Rookie card numbered to 415. 2007 Topps Updates & Highlights Baseball does not introduce any significant new insert sets. Mirror inserts consisting of huge checklists of cards featuring only subtle differences make up most of the chase element. These include Generation Now, A-Rod Road to 500 and Mickey Mantle Home Run History. Barry Bonds Home Run History cards return as well. The started back in 2005. The vast majority of hits in the set come from the All-Star Stitches set. Cards have swatches from 2007 All-Star Game workout jerseys. the ted williams 406 TW set of 36 parallel cards that Target stores inserted. do you still offer these for sale? EBay doesn’t have the 2007 topps cards for sale any more and on-line EBay sellers don’t have the numbers I need, which are #s 28, 33, & 36. This set is also not listed above. don’t offer these cards. Target doesn’t sell 2007 topps any more. 2007 Topps Updates & Highlights Jumbo Baseball Box - 2 Hits!! !